Deep down, Robert Goldner knows he’s a mistake. His mother told him so when he was just five years old. But he never found the courage to ask just what she meant before she was murdered under mysterious circumstances on his eleventh birthday. Now, on the eve of his seventeenth birthday, Robert is dead set on becoming a Virginia high school state wrestling champion in order to redeem himself once and for all, reversing whatever curse his mother saw within him. One of the few blacks on a predominantly redneck team, Robert has struggled for years to remain clear-headed and independent in a school divided by race and conquered by cliques. But when something from Beyond takes possession of his body and mind, wrestling with his very soul, he may find his “birthday” to be a gateway to a horrifying truth about himself and the fundamental nature of Reality. Depicting a teenager’s alienation taken to the extreme, BloodLight is a dark metaphysical fantasy--psychological, bizarre, and intense. A prequel to Broken Angels, the first book in the Eve of Light series. Due to its language and themes, this book is intended for mature readers. 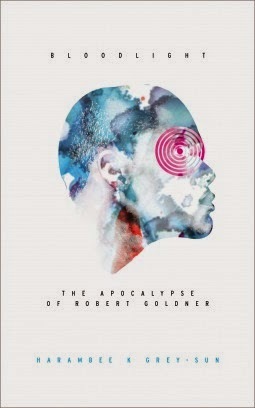 BloodLight: The Apocalypse of Robert Goldner is an intriguing tale that is told from perspective of the main character, Robert Goldner. There is a mystery to be unraveled and while the book is well written with intriguing world building and characters, it was just not for me. I think this is likely due to the protagonist of the story being a young man striving to succeed at wrestling while battling all of the weird that is coming his way, which was very difficult for me to relate to and the reading became laborious for me rather than a joy. I do, however, send kudos to the author as I think there is a great need for more tales of speculative fiction for the young adult male audience, which I think is a likely target audience and this book definitely achieves that goal. I received this book via NetGalley. Welcome to the site of Harambee K. Grey-Sun, speculative fiction writer and poet. The words best describing my fiction are dark and weird. I use elements of fantasy, horror, noir, and science fiction to spin bizarre, mind-bending, sometimes challenging, and occasionally blasphemous tales. The meanings of identity, love, and life; the nature of consciousness, humankind, and God–these are some of my themes. Most stories fall within one or more of the following subgenres: Slipstream, Occult/Supernatural, Superhero, Metaphysical Fantasy, and–of course–Weird Fiction. Most of my poems are narratives, either pieces of a larger story (like the poems in Spring’s Fall) or short stories in verse (like some of the poems inWine Songs). I’m always experimenting with styles and subject matters, but I never experiment simply for the sake of experimenting. When I write, I write for an ideal audience: readers who crave poems that incorporate any and every wordplaying trick (rhyme, alliteration, puns, etc.) in the service of telling an entertaining story. My poetry has appeared in a handful of literary journals, includingCrossConnect, Epicenter, RiverSedge, the South Carolina Review, and theWisconsin Review. I am also an alumnus of the Community of Writers at Squaw Valley.